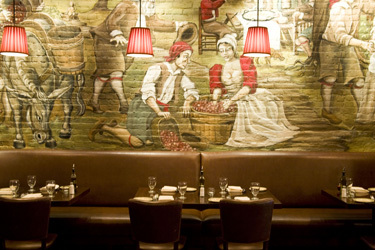 Sorriso (Italian for 'smile') opened its doors in November 2004, instantly becoming one of Boston's most beloved dining and drinking destinations. Ian Just, owner of both Sorriso and its sister restaurant, Les Zygomates, has created a warm and inviting atmosphere that is informal yet sophisticated. Chef John Paine offers a seasonal Italian menu that utilizes local farms for fresh produce, sustainable fish and organic meats. Hand-painted murals of the Italian countryside present the perfect backdrop for an exquisite dining experience while the bar caters to the after work crowd with classic cocktails and an Italian-centric wine list. Surely, Sorriso will be putting a smile on the faces of Bostonians for years to come. Bar Scene... With an effervescent bar scene, Sorriso is an after-work magnet for the Downtown crowd. It rallies a similar energy as its sister French restaurant, Les Zygomates, but this time the theme is distinctly Italian. The killer wine list looks to boutique vineyards from the Boot, and the trattoria tradition includes brick oven pizzas cooked in the dining room. It's the arresting atmosphere that really reels you in, from the masterpiece murals tattooed on brick walls, to the slate bar and burlap curtains.